the fee from buyers is 18 %. "Rural landscape with a bridge" (1895) refers to the early period of creativity of this master of Russian landscape school Maria Alekseevna Fedorova (ur. Ion) and therefore, according to the expert, is of particular interest. In 1881-1892 as volnoslushayuschego student Fedorova attended classes IAH, was twice awarded runner-up medals, in 1892, graduated from the course. Worked as a landscape painter, watercolorist. Participated in exhibitions IAH (1873-1918, with interruptions), Saint-Петербургского society of artists (between 1894 and 1905, with interruptions), the Moscow society of art lovers (1900). In 1892 received a cash prize OPKh, in 1893, for the painting "Evening glow" — first prize in the lottery of the society. In the early 1920-х emigrated to Finland, where he continued to work and teach. Our landscape, though early definitely written by the hand of the established, Mature artist (four years earlier, in the period of study at the Imperial Academy of arts, one of the landscapes M. A. Fedorova acquired in his collection of P. Tretyakov!). Work is filled with air and natural light. 1920-30-м years the expert will take almost a meter of still life "Bouquet of lilacs" Mikhail Varfolomeyevich of LeBlanc. LeBlanc received an excellent professional education. Studied at S. Korovin, L. Pasternak, A. Arkhipov, A. Stepanov, A. M. Vasnetsov, in the workshop of V. A. Serov and K. A. Korovin (Moscow school of painting, 1893-1907); some time worked in the Studio of Ilya Repin at the Higher art school of painting, sculpture and architecture at IAH; in 1910-1912, he studied at the Academy Grand-Шомьер, as well as in the Studio of Matisse in Paris. He lived in Moscow. He painted landscapes, still lifes, portraits, genre paintings of content, worked hard and has exhibited extensively both before and after the revolution. The Exhibitor of many international exhibitions and exhibitions of Russian and Soviet art abroad. Interestingly, among the students of a private school-студии Blanc, organized in 1913, was Varvara Stepanova and FedorBogorodskiy. Our still life of those jobs that are not open to a quick, superficial glance. Its soft flavor, delicate and not the usual color, a bit blurred, as if in the dim light, the contours of the bouquet, freely placed in a vase, not stuck there the vertical beam — all slowly, peacefully, freely and harmoniously. the works of Russian artists Abroad this time is the only work — designed to the smallest detail colorful painting "Corrida" (the second half of 1920-х — beginning of 1930-х) Abraham Minchin, written in an expressive and energetic manner in the style of the Paris school. "In this drama, high emotional States, embodied in Minchina canvases, his works evoke feelings what-то direct involvement in the perpetual motion of life, where you can find everything — from the explosion what-то subconscious, at the level of the Creek, to the different variants of self-irony" (Dmitry Levenson. Inspiration sadness / "Our heritage", 2004, № 69). "the Color of his often sudden and sharp, looking special light effects and lighting... Minchin, of course, an artist as gifted and-то-своему interestingly strange, always turned into a complete and essentially new art" (the writer Boris Poplavsky, ibid.). the Following section of the catalog — the work of Soviet artists. Opens his big (33,6 × up 86.8) watercolors Konstantin V. Churakova "the Novosibirsk hydroelectric power station. The beginning" (1953). Graphically blurred and soft in color and the mood of the piece is the last front formed man and artist. Despite the production plot and the trappings of high energy and big building, there is no squeal and the roar, there is no emphasis on the destruction of the pristine beauty, there is no opposition between man and nature. Continue section two of the autumn canvas: "Autumn day" (1950-е) Pyotr Nikolayevich Andrianov and "In the autumn forest" (1972) Ivan Anatolievich Kovalenko. Similar story, they are different emotionally as a sharp afternoon sun the Golden autumn is different from the soft glow of the afternoon time. Autumn in the middle lane — time when nature plays like a kaleidoscope (remember, in my childhood was a tube with bits of glass that make up the wonderful, not repeating patterns? ): every minute changes in light, color, mood... And now both our auction works remarkably accurately convey the atmosphere in which they were written: autumn light, cool air, striking the suburban flavor of autumn. Watercolor forest landscape "gluhariny Tok" (1974) Alexei Nikanorovich Komarov, one of the best masters of domestic animals, loving and supportive nature. He lived the creative life, books with his illustrations have brought up several generations of young readers, which quickly determine whether they like the picture or not. Liked, Yes, even as times and today driven by reading books with illustrations Komarov in many homes has become a real family heirloom. Urban landscape "khokhlovskiy lane" (1988) Sergei Avksentyevich Kolyada refers to a large series of "Landscapes of old Moscow". This is a very Moscow — soft, but coloristic interesting and beautiful workleads us into the center of the city, to the old houses, which, fortunately, has been preserved until now. 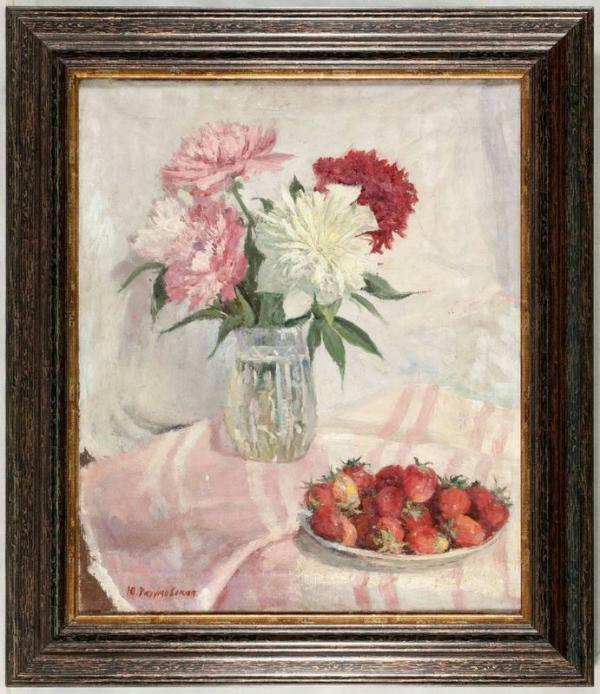 "still life with strawberries" (1950-е) Julia Vasilievna Razumovskaya, student D. N. Kardovsky at the Academy of arts, — bright, colorful delicate work, subtly captures the lightness and joy of early summer. Completes the section is made in the key field of academic studies "Standing" from the series "artist's Model" (1958) Alexander Abramovich Labasa. Two works by masters of the Leningrad underground, we decided to allocate in separate section — is written in a recognizable author's style on canvas "untitled (Landscape with boat)" Vladlen Vasilievich Gavrilchik and a large canvas " No. 243. Christmas" Yuri Zharkikh. Continues the catalogue of one of the most beloved by our members sections — creativity of the sixties. In 1962 made the picture Vladimir Borisovich Yankilevsky from the series "Theme and improvisation". It's a big cycle of paintings and drawings 1960-х years. Figure cut out and pasted on a sheet of paper like a collage. drawing "Panda" (1965) Anatoly T. Zverev refers to a large series of early full-scale drawings, which the artist on the advice of Alexander Rumneva did in the Moscow zoo. Quick pencil sketches a few strokes vividly and accurately depict animals and are now considered the gems of the early Zverev. 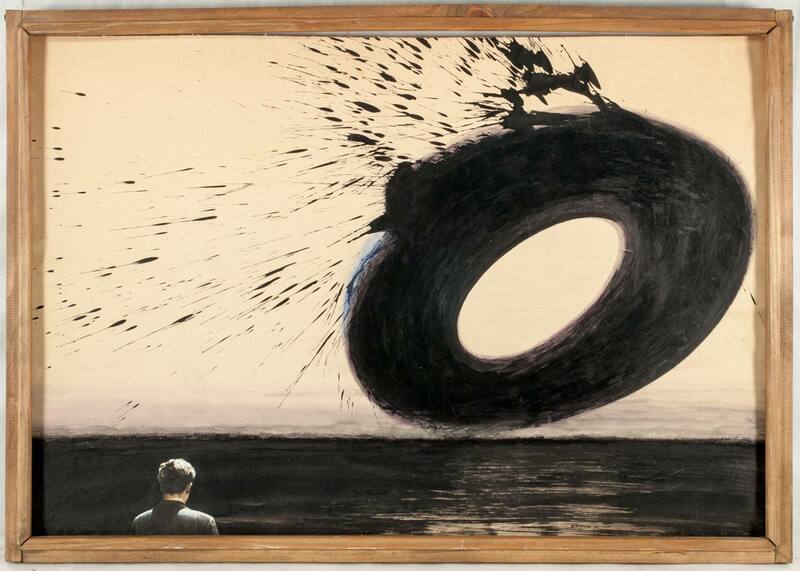 One of the absolute top-лотов our current catalog — cardboard "untitled (Composition with black circle and a man standing with his back to the audience)" (1970) Peter Ivanovich Belenok. The artist jokingly called his painting panic realism. An example of this style is our job, but that's not really the style that would later be called canonical. The painting is divided into two unequal areas: wide and narrow light upper dark lower; later, the artist will change the color in some places. In the lower area placed the human figure, in the upper area is a huge abstract something, a bundle of energy. "It is transmitted fashistskim stroke the brush... the Resulting figure is the painting in its purest form, its natural pointlessness contrasts sharply with the realistic element of the film, resulting in an effect of "invading another world." <...> "Little men," Peter Belenok for the most part cut out of the sporting Newspapers and magazines — that's where you can find photos of running, jumping, falling, screaming athletes and fans" (source: mmoma.ru). 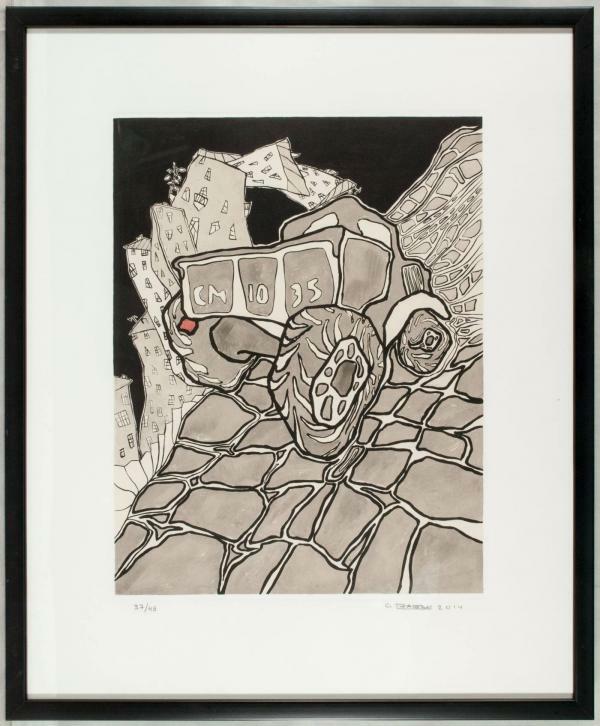 In Moscow suburbs the middle of the last century, across a broad cobblestone pavement, surrounded by antediluvian wooden fences and boring boxes of high-rise buildings, it carried "the Truck" (2014) Oscar Yakovlevich Rabin, performed in a sophisticated printed graphics technology. In this work all — movement: and houses, and roofs, and the road steeply going up, and even the fence — symbol of the inviolability — is hopping. The urban landscape in a recognizable labinskom incarnation — extremely positive thing! the Peculiar arrangement known image of the famous poet by means of the author's unique visual language provides us draw sheet "Jack "Mayakovsky"" (2014) Vladimir Nikolaevich Nemukhin. Completes the catalog creativitycontemporary authors. 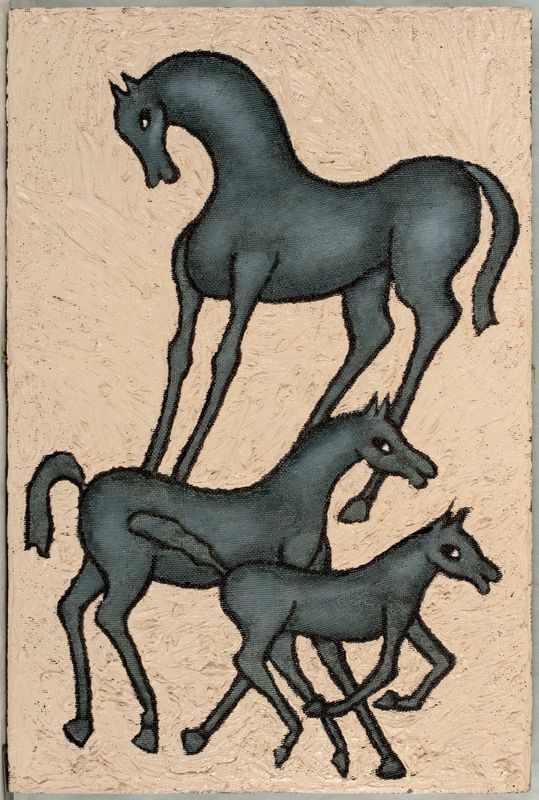 a Joyful and positive thing — work "untitled (Horses)" (1973) Sergei Sergeyevich Gubantseva. Virtuoso graph, draftsman of Kubantsev in this work oil reveals a completely different perspective: the rough burlap that wraps around the heavy sheet of plywood, poured a gentle, shimmering with the dawn of pink colour, and her three horses roam — funny little Igrunov with a weary look. 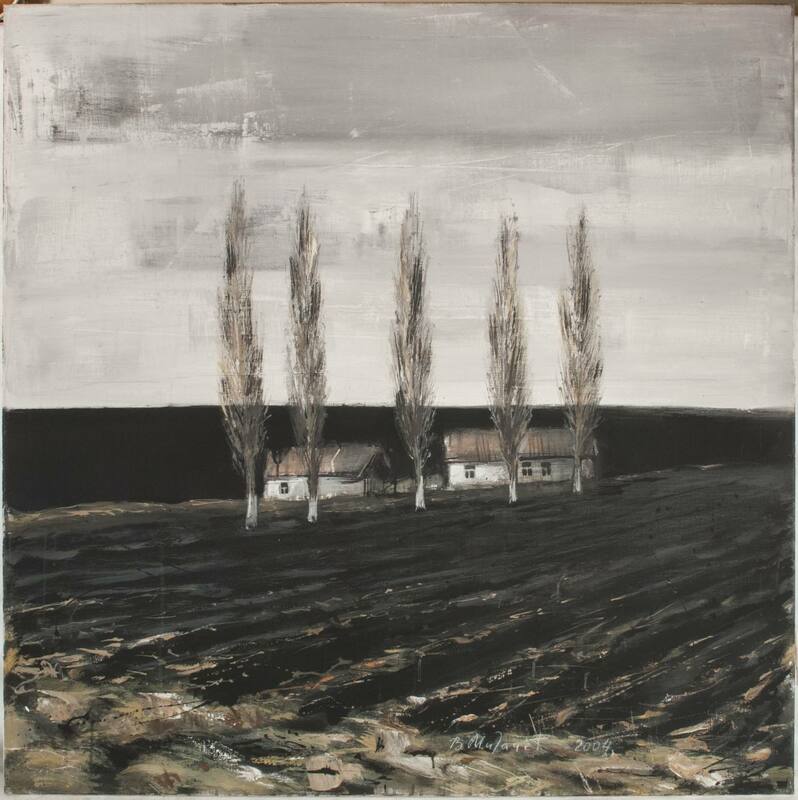 Large (120 × 120) canvas Vladimir migacheva "Landscape with poplars" (2004) — almost monochrome work with acrylic. "Considering the visible here and now illusion, does not achieve the maximum degree of generalization" (source: art-story.com), the artist does not paint from nature, he "brings the basic components of the landscape — earth, sky, water, tree — to the state of laconic formulas and symbols" (source: erarta.com). Here in our work the island farm and pyramidal poplars on the border of the black fields ploughed and leaving for horizon still looks pristine land on the canvas a symbol of the transient (even so, the warm, living) at the border of the eternal. Canvas Migachev famous author's technique, which uses not only the traditional painting materials, but very real land, coal, cement, etc., however, our landscape concise in everything, including technology. And it further emphasizes the symbolism of the image. Work-настоящему beautiful, decorative and makes a strong impression. Completes the directory canvas in mixed media (print and acrylic) "Daddy!" Alexander Savko. As usual, the author operates with well-known images, but puts them in the unfamiliar environment and situation and watch what they have in a new place. Those who are going first to buy a painting or drawing, would be helpful to know that no monitor ever authentic will not give works of art. Color, texture, not to mention the aura of a particular work, the impression from the meeting with her, the monitor is not subject. Good thing he can do at least wishy-washy, and not very good, on the contrary, to embellish (the last one we have, but it is fair to say it's worth). In addition, each person sees and feels by-своему. So come see all the work with my own eyes we have, Gorokhovsky, 7 (only need to call and make an appointment). we Wish you all a good bargain and good shopping! 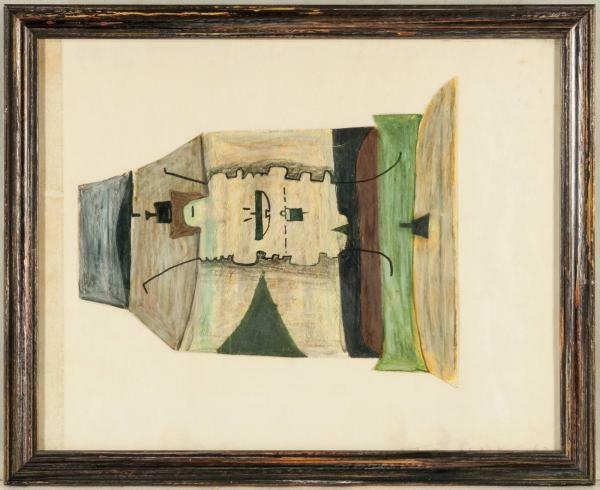 Fair market price level on the works of the authors represented in the catalog of this auction can be identified in the information database of auction results ARTinvestment.RU. On the auction AI continues to operate a virtual party "Reserve price is not reached". He appears in the final minutes of trading, so that customers have the option to kill the reserve price (for those items where it is). In other words, if you see party "Reserve price is not reached," that is a reason to continue the fight — perhaps the victory is near. If the latter rate appears accompanied litters "Until reserve was 1 step", it means that making the next bet, you win the auction — unless, of course, who-нибудь, inspired close luck not interrupt your last words. And always a shame when participants traded a few days and especially the last couple of hours excitedlybefore closing suddenly stop just one step from victory. If you feel that thing — is yours, so take this step! fee from the buyer is 18 % of the final price of the lot. And more. We recommend you to follow the updates on our the new affordable art auction AI Market. The site operates seven days a week, every lot is different the exposure time, and the Commission paid by the buyer, is 20% to the price of won auctions. 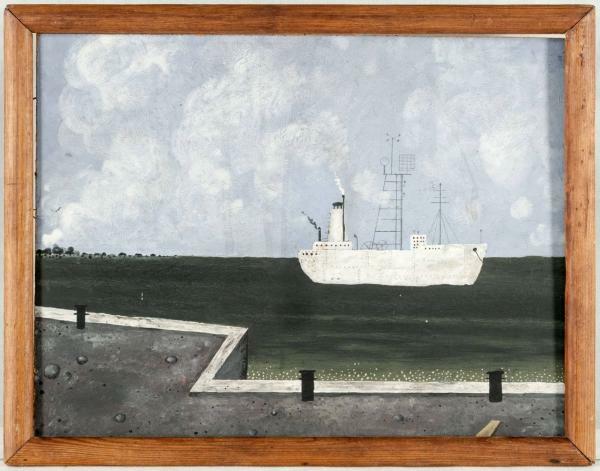 We continue to make paintings and drawings (original and lottery) to our regular weekly auctions. About his desire to put the thing on the auction AI write info@artinvestment.ru or call: 7 (495) 632-16-81. Rules of submission for auction AI can show sdes. 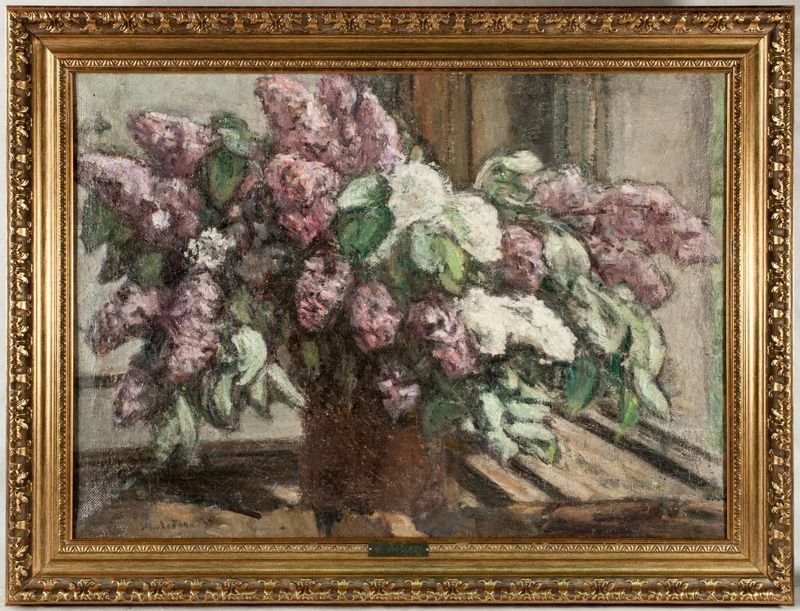 Regular auction of art and collectibles are conducted using an automated auction bidding system, available at https://artinvestment.ru/sales/. In normal mode, each online-аукцион lasts for four days. But if the rate on a-либо lot done in less than 30 minutes before closing Internet-аукциона, the bidding for this lot will automatically be extended for another 30 minutes. After these 30 minutes, if not received the new rate, Internet-аукцион will be closed — otherwise it will be extended for an additional 30 minutes. Such a trading mode, as shown, making pointless attempt to postpone rates until the last seconds before the closing of the auction and encourages participants to bid in comfort mode during all days of the auction. According to auction Rules, to participate in the auction, ie to bid on the proposed lots for sale may only individuals who register on the site Auction (Auction administration reserves the right to test applicants and to refuse registration without explanation). Continue to save time and money of the participants, the electronic system on behalf of each of them is trading with other participants, making the lowest possible rates to a specified amount of a participant. The minimum rates indicated in the description of each lot. If the maximum prices on the same item listed in two or more rates match, the winner is the bidder whose bid has been done before. fee from the buyer AI Auction is set at 18% of the final price of the lot. Payment is made in rubles in cash in the office of the Auction or by wire transfer to the account of the Auction. The Auction gives buyers of permits for export outside Russia of goods purchased at auction, and does not guarantee the possibility of obtaining such permits. Sending lots outside of the Russian Federation the administration of the Auction is not possible. ARTinvestment.RU — information-аналитический resource on the art market, the developer of a family of indices of the art-рынка and compiler ARTIMX the world's largest database of auction results for artists outside the orbit of Russian art. In its analytical work ARTinvestment.RU relies more than 250 million auction sales results for 13 thousand of Russian artists in the segments of painting, drawing and sculpture. Unique indicators of investment risk assigned by the experts ARTinvestment.RU help exclude many of the estimated massquestionable results.